Reading accounts of survivors is no substitute for an actual interview. Here is one with Eva Hart that brings the story of Titanic to life. The letter written by Titanic survivor Esther Hart was auctioned off today for £119,000 ($199,950) according to ITV. The letter was written aboard Titanic hours before the ship sank. The amount is a new record according to auctioneers Henry Aldridge & Son. The previous record for a Titanic letter was £94,000 ($157,943). 1. MLB TV has had problems this season. Due to technical problems caused by a third party, watching on Roku has become a guessing game. Will the home or away feed be the one not working right, both, or should one just listen to the game instead? MLB is promising to fix the problem. 2. A Titanic exhibition in Estonia that recently ended broke attendance records for the museum. The Baltic Course reports that 220,000 people visited the “Titanic: story, findings, legends” exhibition that ran from November 2013 to March 2014. “Such a high visitors’ number at our museum landscape is undoubtedly extraordinary and exceeding or even repeating that would be rather complicated. The number of guests of the Titanic exhibition is proof and acknowledgement that we have offered to the public a world class museum experience,” said Maritime Museum director Urmas Dresen. 3. A letter written by the mother of Titanic survivor Eva Hart will be auctioned off next month reports the BBC. The letter is written on Titanic stationery was addressed to her mother in Chadwell Heath, England. The letter was found inside her husband’s jacket after they were rescued. Henry Aldridge & Son are the auctioneers for the letter and is perhaps the only one of its type to have survived. 4. Since opening two years ago, the Titanic Belfast Visitors Center has been visited by 1.45 million people reports Irish Times. It has drawn people from all over the world and broke all projections for attendance. 650,000 people passed through last year showing interest in Titanic has not slowed down. 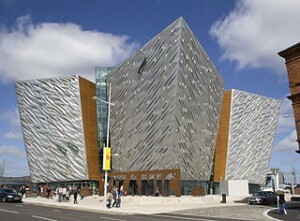 Needless to say, Titanic Belfast is “delighted” with the news. This year’s Titanic Festival – running between 4-12th April – will also present the works of Hungarian film makers too. Erik Novák’s brand-new action-thriller and black comedy mixture Black Soup will have its premiere screening at the festival. Simon Szabó’s short film Wall that won the main award at the Tampere Short Film Festival, and Réka Bucsi’s animation short Symphony no. 42 that competed in the Berlinale can also be watched at Titanic. The original score for the Turkish movie The Long Way Home was written by Mihály Víg, and a special film selection and a round table-discussion will commemorate the recently deceased Miklós Jancsó. A journalist will provide a multi-media presentation about Irish-American Titanic survivors and the lives they lived out in the United States during the next monthly meeting of the Irish-American Cultural Society. Jim Curley, a journalist with personal ties to the story, will present a multi media talk on a County May village that sent a group of young women off for better opportunities across the Atlantic Ocean. Curley will give his presentation during the next meeting of the Irish-American Cultural Society at 7:30 p.m., Tuesday, April 15 at the American Legion Hall, New Jersey Avenue and Mill Road, Absecon, NJ. Boston based RR Auction will be putting the Roston Cup and other Titanic artifacts up for auction online from April 17-24. Letters photos and other memorabilia will be up for auction and the Roston Cup will likely be the big ticket item for this auction. For details and information about the auction, go to rrauction.com.